The fast-paced, noisy environment of an emergency room isn’t always conducive to the needs of aging patients. On top of that, seniors may come to the emergency room for a single problem like a fall, but they often have underlying conditions such as memory loss or mobility issues that go untreated, which can lead to repeat hospital visits. As the country faces a deluge of older patients, emergency departments nationwide are seeking ways to improve their care. This year, the American College of Emergency Physicians (ACEP) started accrediting emergency departments for geriatric care. The organization not only looks for improvements in the physical environment — such as easy access to food, drink and mobility aids — but also for a more comprehensive approach to the distinct health needs of older adults. 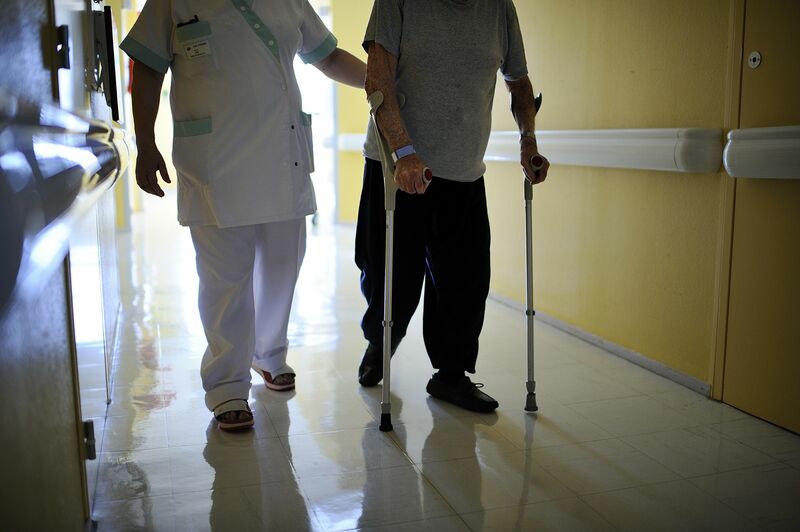 The idea, according to geriatric emergency medicine expert Dr. Kevin Biese, is to not only to address a patient’s fracture, but to do everything possible to keep that patient from falling again. That approach is part of the larger movement toward team-based care for patients with complex needs. “By thinking not just of that day’s care but of their care downstream, we can change the trajectory,” said Biese, an associate professor of emergency medicine at the University of North Carolina at Chapel Hill. Since the first emergency departments (EDs) were accredited in May, 23 have received the designation and about 100 have begun the accreditation process, according to Biese. These hospitals span the gamut from large academic centers to smaller community hospitals. While data is still preliminary, there have been some positive signs already, Biese said, such as a 9 percent decrease in return visits to the ED within 30 days at Aurora Sheboygan Memorial Medical Center in Wisconsin. For reporters covering their the local hospital, the certification offers a more meaningful indicator than hospital marketing, said Dr. Zia Agha, the chief medical officer at the Gary and Mary West Health Institute, whose founders contributed $11.8 million to launch a geriatric emergency department in La Jolla, California. Agha cautioned reporters to be skeptical when hospitals describe themselves as a geriatric emergency department without accreditation (it might just mean they added better lighting or non-skid flooring). At the Gary and Mary West Emergency Department at UC San Diego Health in La Jolla, California, about 2,000 patients have received specialized services since the hospital received the designation this year, Agha said. Seniors who arrive at their emergency department are treated by a team of specialists in geriatric medicine who focus on senior-specific issues such as fall risk, cognitive and memory problems, and medication interactions. Agha offered the scenario of a senior who trips and falls in her house. She comes to the emergency department, where she’d typically be assessed for a fracture. After that, she’d either be sent home or admitted to the hospital because she was deemed unsafe. Underneath that broken bone could be a whole host of underlying conditions that led to the fall, such as overall weakness or memory lapses. If those issues aren’t addressed, the patient is more likely to return again and again to seek care. With a team approach, that patient would also receive screening tests to gauge her cognitive ability, strength and nutrition. Maybe a social worker would discuss home health care, or the patient might receive a physical therapy appointment. She might also need a consult with a psychologist. If necessary, she might receive a walker or wheelchair, or be connected to a food or medication delivery service. Within her home, she might need adjustments such as a bathroom safety railing. “A lot of this is air traffic control – making sure all the resources get to the senior to make sure she can recover,” he said. Shouldn’t every ER do this? I asked Agha and the other experts whether the certification might encourage seniors to only attend specific emergency departments. Shouldn’t it be the mission of every emergency department to provide services to geriatric patients? Agha said the goal is to raise geriatric care for all emergency departments by putting in place higher standards of care. While some ERs might have space and resources for a special senior section, others will simply add safety features to existing rooms. More commonly, services and staff training for seniors will be bolstered in the department. Dr. Michael Malone, a geriatrician and the medical director of Senior Services for Aurora Health Care, a not-for-profit health care system headquartered in Milwaukee, said it’s important to prepare the health care workforce for the distinct needs of older adults. He pointed to a screening tool for older adults now being used in his health system’s emergency departments known as the “road test.” Nurses do a timed assessment of a patient’s gait and balance to determine their risk for a future fall – and connect them to resources they might need such as physical therapy or mobility aids. For the emergency department staff, that screening process has also broadened their own perspectives, added Aurora’s Aaron Malsch, a registered nurse and the senior services program coordinator. Sometimes, providers learn that an elderly patient doesn’t have transportation to get to the pharmacy for medications – something that could be sending them back to the emergency room over and over again. The team might help connect a patient with a primary care provider, talk about how to de-clutter the house or teach them exercises to improve balance. “We can provide the best diagnosis and treatment but you need to put that in the fuller context of a human being and the life they live,” Malsch said. ...another problem that seniors are FAR more likely to have is hearing loss, which can lead to mixed signals (and mistakes) in healthcare settings of all kinds.